NY Giants pay Eli a bonus to be their starting QB this fall…. The NY Giants front office is STILL SOLID with Eli Manning…. For those of us wishing for something else? We’re gonna suffer ANOTHER season…. 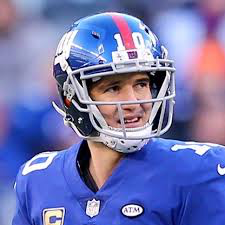 When Eli Manning’s $5 million roster bonus kicks in Monday at 4 p.m., it will provide financial clarity to what is already known about the 38-year-old, two-time Super Bowl MVP: He will be wearing blue as the Giants’ quarterback in 2019, for the 16th consecutive year. Manning might not be the only quarterback who gets to play for the Giants this season. That depends on whom they might take in the NFL draft next month or whom they might acquire (Josh Rosen?). Manning returns as the starter, though, despite the team’s downward spiral since its most recent rise to greatness: winning Super Bowl XLVI in February 2012. Since then, the Giants are on their third head coach (Tom Coughlin to Ben McAdoo to Pat Shurmur) and their second general manager (Jerry Reese to Dave Gettleman), uncommon upheaval for a franchise with ownership that prides itself on patience and stability. The Giants are 8-24 the past two seasons, and Manning is 8-23 as the starting quarterback in that span. The new regime of Gettleman and Shurmur believes Manning can get the job done as long as he is protected by an offensive line that will be in its second year of a total rebuild and as long as the focal point of the offense shifts to running back Saquon Barkley. Last week’s stunning trade of superstar receiver Odell Beckham Jr. to the Browns sent away Manning’s most dynamic weapon — one of the most lethal targets in the league — but the Giants did not win much with Manning throwing to Beckham, and now a team searching for answers will go with more of a spread-the-ball approach. That Manning is returning on his full salary is baffling to many…..
People are talking about the Ginat not even picking a QB in the first round of the draft??? ?